Home media servers are an emerging market, combining the utility of network-attached storage (NAS) with the consumer-focus of external hard drives. Designers have many visions for the home media server, and Promise’s is perhaps the most ambitious we’ve seen yet. Rich in features and capable of RAID configurations and storage capacities others can’t match, the SmartStor NS4600 is easily the most high-end home media server on the market currently. The NS4600 will easily appeal to power users who have in-depth experience with RAID and network configuration. However, the thick instruction manual and use of removable hard drives configured in a RAID array will likely deter most midlevel consumers who want a no-nonsense server. The SmartStor NS4600 is on the pricey side for a home media server ($499 without hard drives), but is one of the most feature-heavy units we’ve seen. Unlike other home media servers, the NS4600 supports different RAID levels. You have to populate the SmartStor NS4600 with up to four hard drives (which you have to purchase separately from a third party) and format the drives using Apple’s Disk Utility before attaching the server to the network and allowing user access. The cryptically designed SmartNavi desktop application comes with the SmartStor NS4600 for administration. When you launch SmartNavi, the program opens a small window with a series of colorful icons on the left side that are actually configurable shortcuts. To use these shortcuts, you’ll need to follow the instruction manual on setting up accounts and passwords, and formatting the hard drives-not exactly a simple process. This lengthy setup will only allow you to access the shared folders that appear as a network device, not necessarily fine-tune the folders for the average consumer’s use. After setting up your folders, you must turn on the iTunes and backup services in a separate series of steps. If you double-click on the server icon in SmartNavi’s desktop window, you can access the bigger desktop application and its full set of features. Though using SmartNavi was a chore, the controls are colorful and the available features are deep. Promise also has a Web-based advanced management tool that allows you to configure the server in a more detailed way than the desktop application permits, but the interface puts so many options at your fingertips that it’s a bit daunting. This tool also allows users to take advantage of multiple RAID options. It’s easy to configure RAID 0, 1, 5, and 10 with the tool, and you can also use it to access other abilities, such as managing users and groups. Though it arguably offers the most versatile bundled software of the home media servers we’ve tested, the SmartStor NS4600’s generally unintuitive nature and daunting setup process make it a tool best reserved for seasoned experts. One of the most useful features of a home media server is the ability to share music and playlists with people on your network. iTunes displays the server as a shared device, and you can access and play the songs on the server, as long as the songs are free of digital rights management (DRM). While all songs on iTunes are currently DRM free, that wasn’t always the case. If you’re a longtime iTunes shopper, you may have amassed plenty of copy-protected iTunes songs, and only the account used to purchase those songs can play them. Thankfully, the SmartStor NS4600 has the ability to play media with DRM restrictions and video through iTunes, as long as you are the registered owner of the media. Promise’s Web-based software can be configured to only allow certain users to access the music-ideal for families who want to keep their mature-rated music content away from their children. In addition to providing Time Machine support, the SmartStor NS4600 also boasts Snapshot Backup, a feature of Promise’s software that enables users to take a quick real-time image of the storage volume. Users can then restore the specific point-in-time data, which is great for consumers with sensitive documents they can’t afford to lose. Promise offers a remote access feature that allows users to access music, video and picture files from anywhere that has internet. The NS4600 also offers a print server; users who want to share a printer over the network can utilize the SmartStor as a central hub. The SmartStor NS4600 also supports BitTorrent downloads. The computer must still load the file, but only the SmartStor NS4600 itself is needed for downloading it. You can download BitTorrent files via the Download Station tab of the SmartNavi software. The SmartStor NS4600 supports a wealth of BitTorrent protocols and can handle all kinds of file sizes. For users with high-capacity storage needs (like audio/visual experts), the SmartStor NS4600 is a compelling option. 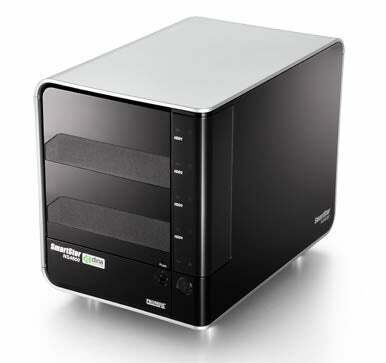 With its four-drive-bay design, the SmartStor NS4600 is the most easily upgradable. In addition, the Promise has an eSATA port and two USB ports that allow you to add more hard drives. The upgradeable, RAID-configurable, and feature rich SmartStor NS4600 is a high-end home media server. It’s ideal for home or office settings that have large storage needs and especially concerned about security. It’s still a long way from being the most consumer-friendly unit on the market, especially given its unintuitive interface design. The SmartStor NS4600 is a solid, if narrowly focused unit. Editor's Note 7/30/09: Corrected to affirm remote access features and number of drive bays.